So yes, surprise of all surprises occured a week ago in Aachen. BDP got 2nd prize in the huge Karlspreis for Youth. They recognised the quality of our content, our ambition to question the borders of not only 'Europe' but also what young artists and writers and activists can get away with regarding preconceptions toward them and their work. Free of any big organisation - unlike many of the other projects - our work was independent and yet sure of itself. I was delighted to get to go on behalf of the team and pick up the prize. Line gets to go to the EU parliament this autumn. I'd like to thank everyone here who worked with us on the book. All our great contributors, our translators (Joy! ), our design team, all our hosts, all our supporters, our few and very special buyers of the book, and Youth in Action for first giving us the chance to start things. Things went really strange just before we were all due to leave Aachen. After a week of drinking and making fun around town, I woke up with no clean clothes left, unwashed hair that was in a bad need of a haircut, a hangover, and a growing feeling that they might have meant what they said about sharing the stage with the bigwigs. 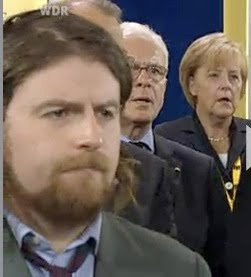 An hour and a half later, live on German TV, I found myself about to vomit, and with my great imagination sat through the first half hour of the live transmission of the prize ceremony for Polish Prime Minister Donald Tusk picturing myself vomiting, or fainting, or simply standing up and walking (or running, why not?) out the door. I hate TV. Always have. Now I really hate it. Who knew making books could be so surreal?